On November 13th, EMI will finally release the remasters of The Beatles catalog on vinyl. Available on CD and digitally since 2009, the remasters cover all 12 of the band’s studio albums as well as the Magical Mystery Tour soundtrack and the rarities compilationPast Masters. According to RollingStone.com, stereo versions of each album will be issued on vinyl individually and released together in an expansive box set. The mono versions will follow in 2013. 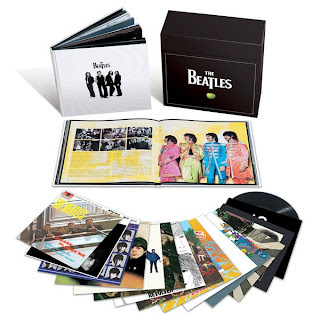 Limited to 50,000 copies worldwide, the box set contains the 14 releases across 16 LPs and includes original features like the Pepper’s Lonely Heart Club Band cutouts and a reproduction of the poster that accompanied “The White Album”. The set will also include new hardbound book by radio producer Kevin Howlett, filled with photographs and chapters dedicated to each records. At the start of the restoration process, engineers conducted extensive tests before copying the analog master tapes into the digital realm using 24-bit/192 kHz resolution and a Prism A-D converter. Dust build-ups were removed from tape machine heads after the completion of each title. Artifacts such as electrical clicks, microphone vocal pops, excessive sibilance, and poor edits were improved upon as long as it was determined that doing so didn’t at all damage the integrity of the songs. Similarly, de-noising technology was applied in only a few necessary spots and on a sum total of less than five of the entire 525 minutes of Beatles music. Compression was also used sparingly and only on the stereo versions to preserve the sanctity of the dynamics. A rigorous string of checks and balances ensured that the results exceeded expectations. Subject to numerous playback tests, songs were auditioned by the remastering team to determine if any lingering mistakes needed correction. The restored versions were also compared side-by-side against the original vinyl pressings (loaded into Pro Tools), and then again auditioned in the same studio where all recent Beatles projects, including Love, were mixed. Once all EQ issues had been addressed, another round of listening litmus tests occurred in still another location. Finalization required the approval of everyone involved in the remastering process. For this project, there was no such thing as too many cooks in the kitchen. Yes, it took a village to get it right.